Here’s an open letter to President Obama that he will never see. Not because I didn’t send it. I did this weekend in the form of faxes. I just want to stick it up here on the interwebz Mr. President, in case you would like to refer to it later. You know, in case you forgot. Sir, Please stop what you are doing and listen to the people you serve. We don’t share your view of America. We The People want you and Congress to start over on Health Care Reform. There are better ways to help people get medical care than enslaving the rest of us (US). Just had to get that out of the way. Now, today’s topic is Free Speech or more aptly, the restriction of it. Because I made this cool Motivator. That’s why. Back in August 2009, Barack Obama said that he wanted his critics to shut up and get out of the way. Then, in October 2009 he cosponsored an anti-free speech resolution at the United Nations. Whatever he says he deplores, he deploys. 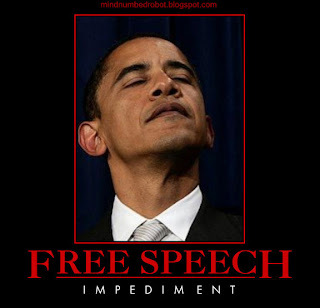 This man is the biggest threat to our freedoms in the last one hundred years, possibly evah. While he’s cosponsoring resolutions at the UN which denounce incitement and hatred, he has shown that he has had no qualms with those tactics in the past, as when he suggested using those same tools against his opponents during the presidential campaign. Watch him. Watch what he says, then watch what he does. I guarantee you the two are diametrically opposed. So now, we are invited to watch his narcissism on display as he is obsessed with shoving his beloved Health Care Plan down the throats of an unwilling populace. (Sorry for that visual.) Are we to sit idly by while this happens? That is what the authors of this little play would have us do. That or fawn all over them like sycophantic groupies backstage at a rock concert. I can’t and won’t do it. Any psychiatrists/neurologists in the house?